The Easter Bunny has been around for a very long time. 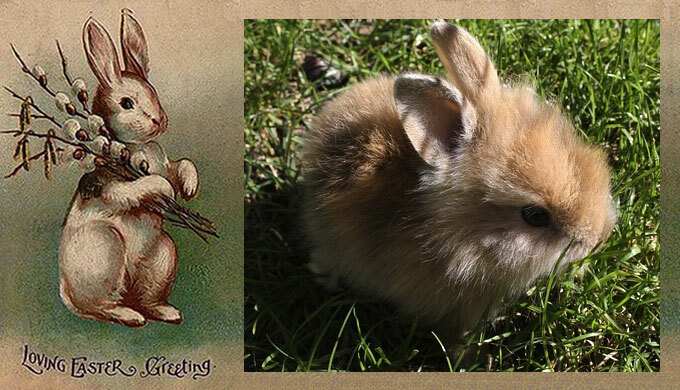 As early as 1682, there was a reference to the German tradition of an Easter Hare bringing Easter Eggs for the children. Sometimes a live rabbit would be brought to the church, representing the Easter Bunny. 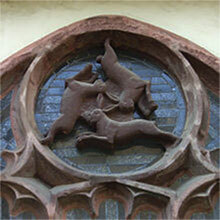 The rabbit can be found in medieval church art as well, as it has been connected with the Virgin Mary, the Holy Trinity, and the fertility of springtime. Christians of the Eastern Orthodox Church would dye eggs red for Easter, recognizing the blood of Christ but also the renewal of spring. Some used the color green to honour new foliage, and the Ukrainian art of decorating eggs for Easter dates to ancient, pre-Christian times. Who but the Easter Bunny would carry these eggs to the children? Thus in modern America, the Easter Bunny visits children with baskets of chocolate or candy eggs. And sometimes a real bunny is given to a child at Easter. What could be sweeter than your own soft, cuddly little bunny rabbit to cuddle and play with? Bunnies don’t like to be held. They may think you are a predator who wants to hurt them. They might struggle, bite, or run away. They cannot be passive. Their instincts as prey animals tell them to escape. They can be shy and jumpy and can take a while learning to trust you. A child may soon be put off or, on the positive side, may have the opportunity to learn patience. Bunnies are delicate and can easily be hurt if stepped on or handled improperly. A rabbit can live ten years or more and requires as much care as a dog or cat, including the need for spay/neuter surgery. They can be trained to a litter box, but you must keep it clean, as well as their cage. 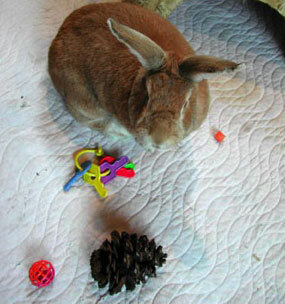 Rabbits need exercise, and when they enjoy running around the house, they can leave a trail of dry pellets behind. Rabbits love to chew on electrical power cords. Just think about that one! The main portion of a rabbit’s diet must be hay, with a small amount of greens. In fact, you should only provide carrots in tiny portions as an occasional treat. Bugs Bunny is not a healthy role model for your rabbit! House Rabbit Habitat. 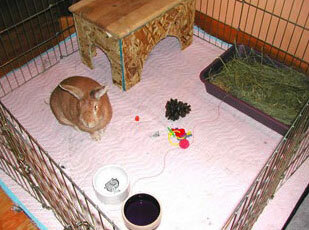 Use an old blanket or rug under the exercise-pen. This protects your floor, and can be easily washed and gives your bunny a soft place to play. When the bunny—now a full grown rabbit—is more trouble to care for than expected, that well intended Easter gift may be dropped off at the local animal shelter. In fact, each year by six weeks after Easter, shelters have an abundance of rabbits who need new loving homes. A worse choice of irresponsible rabbit owners is to dump the creature outside on its own. In such a case, the rabbit ends up as a meal for a predator because a domesticated rabbit cannot fend for itself in the wild. For some great suggestions from organizations that specialize in the care and adoption of rabbits, visit these websites: www.saveabunny.org and www.rabbit.org . These wonderful non-profits take in abandoned rabbits, providing veterinary care, spay/neuter surgery, and finding new homes. You can make donations easily online. A rabbit litterbox. 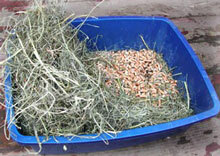 Use a plastic cat litter pan, put a layer of pellet stove pellets on the bottom, next put a few handfuls of hay, and top with fresh grass hay daily. Right now our local Palo Alto Animal Services has some beautiful rabbits available for adoption. This Easter, when you visit the pet store and are tempted by the soft, furry, cuddly little bunny rabbits, be sure in your own mind that you are ready to take responsibility for proper care and feeding. Excellent article and very good advice! Thank you. 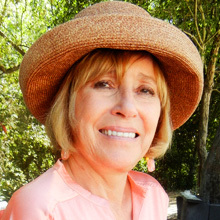 Susan, we are pleased that you enjoyed our article on rabbit care. Jeremy did most of the work, and we had valuable input from Amanda Materne, a rabbit lover who gave us the links to local rabbit rescue groups. Thank you for your feedback!